Map of Kampala showing the location of Makindye. Makindye is a hill in Kampala, Uganda's largest city and capital. The name also refers to the neighborhood that sits on that hill. 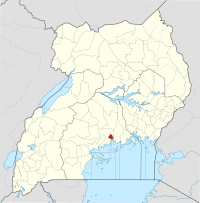 Makindye is also the seat of Makindye Division, one of the five administrative zones of the city of Kampala. Makindye is bordered by Nsambya to the north, Kibuye to the northwest, Najjanankumbi to the west, Lubowa in Wakiso District to the south, Luwafu to the southeast, and Lukuli to the east. Kansanga and Kabalagala lie to Makindye's northeast. The coordinates of Makindye are 0°16'45.0"N, 32°35'10.0"E (Latitude:0.279175; Longitude:32.586120). The road distance between Makindye and the central business district of Kampala is about 6 kilometres (3.7 mi). Makindye, at its peak, stands 1,230 metres (4,040 ft) above sea level. It affords a view of the surrounding areas of the city and of neighboring parts of Wakiso District. It also affords a view of Murchison Bay, a part of Lake Victoria to the east and southeast of Makindye. The residential areas on Makindye hill are of middle class proportions. Many of the homes have adjacent plots of land that are often used to grow vegetables. Kiruddu General Hospital - A public hospital administered by the Uganda Ministry of Health - In development. ^ Google (18 June 2014). 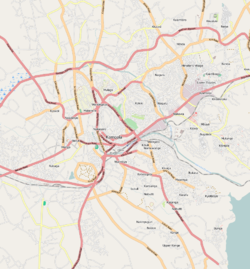 "Location of Makindye, Kampala City, Uganda" (Map). Google Maps. Google. Retrieved 18 June 2014. ^ "Distance Between Central Kampala And Makindye With Map". Globefeed.com. Retrieved 19 June 2014. ^ Ikwap, Emma (31 July 2013). "Know Your Hood : Makindye, A Place From Which You Can Easily Access The City". Daily Monitor. Retrieved 19 June 2014. ^ Wacha, Joe (14 May 2013). "Government Moves To Construct Referral Hospitals In Kawempe, Makindye". Uganda Radio Network (URN). Retrieved 19 June 2014. This page was last edited on 25 March 2017, at 04:25 (UTC).